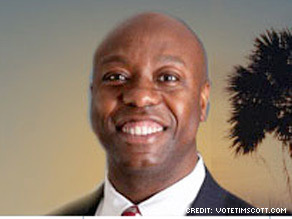 State Rep. Tim Scott, will face a runoff election against the son of former Sen. Strom Thurmond on June 22. Columbia, South Carolina (CNN) - The wild battle for South Carolina's Republican gubernatorial nomination dominated the headlines on Tuesday night, but the election results also set the stage for a congressional runoff election with compelling historical overtones. In the state's first Congressional district, South Carolina's only African-American lawmaker will face the son of former Sen. Strom Thurmond in a June 22 runoff election. State Rep. Tim Scott, who had the backing of the anti-tax Club for Growth, won 31 percent of the vote on Tuesday in the crowded, nine-way race to fill the seat being vacated by Rep. Henry Brown. Scott is a state House member from the Charleston area and would be the first black Republican in Congress since Rep. J.C. Watts retired in 2003. His opponent in the runoff will be Paul Thurmond, an attorney and the son Strom Thurmond, who spent 43 years in the United States Senate and famously ran for President on a segregationist platform in 1948. Thurmond earned 16 percent of the vote on Tuesday. Jim Clyburn of the 6th congressional district might be very surprised to find out that Mr. Scott is "South Carolina's only African-American lawmaker." Perhaps you meant "at the state level"? This guy JUST became a punching bag for liberals.